ELIWAGAR is a pagan folk band formed in France in 2006, relocated to Norway after a couple of albums and with a fair amount of releases ever since. “I Vølven’s Vev” is their eleventh full length effort. Therefore you can expect a matured songwriting culminating in anthems of extramundane beauty. The main focus lies on haunting yet memorable vocal melodies with an utterly peaceful and joyful atmosphere. 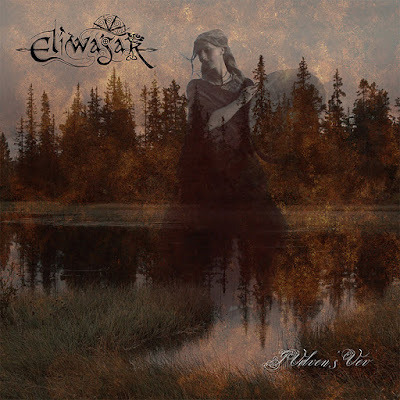 Around the mystical atmosphere, Eliwagar weaves a subtle harmony network with a steady hypnotizing drive. Most of the tracks feature bewitched percussion, acoustic guitar, flute and natural sounds like the whispering wind the waves rolling on the rough Nordic shore. These are backed by the enchanting voice of Brenda Runahild, the front woman behind Eliwagar. The songs drag you into a dreamy state and make you think of druids and heathen ceremonies. This is by far one of the most outstanding gems in the pagan folk genre and on par with great acts such as fellow Norwegians WARDRUNA (despite ELIWAGAR are more melodic and dreamy), IN GOWAN RING (just with an emphasize on Norwegian folk) or FAUN. Eliwagar knows how to create a whole world of mystical sounds that unfold in front your inner eyes and ears. Sound and performance are as brilliant as the compositions themselves. A giant masterpiece of current pagan folk music!